The Knickerbocker Cottage: "peace be with you!". Thread: The Knickerbocker Cottage: "peace be with you!". I am currently attempting to ascertain the exact location of this building (such as lot/block number) as well as some historical context regarding the people, and events associated with the creation of the 'Knickerbocker Cottage'. I will post what I can find on the subject, graphics, links, commentary - whatever I come across. Input of any kind on the subject would be greatly appreciated. The above link shows a vintage photo of the original building. Comparing the original with the current location photo on google maps, it seems to me - judging mostly from the masonry sill & lintel of the windows - that much of the original building is still standing there on 6th Avenue. Yes, so far I think it would be a fair assumption to say that at least the two 'street-wall' sections of the original building art still standing. I am still not completely sure - but it will be easy to find more. If this is an Historic District, there will be plenty of archival photos & documents: heres hoping this one is landmarked. Last edited by infoshare; January 29th, 2012 at 09:11 PM. The address of the original Knickerbocker Cottage was 456 6th Avenue; apparently, at some point this building was used as the residence or commercial building of an inventor. The address 456 6th Avenue, is at the end of this 'scientific american' article; Mr. Hicks, invented something called a "gold washer". You say "original." Was there more than one? I was wondering why several New York Times articles place the building at 6th Avenue between 27th and 28th Streets. So far I found articles dated 6/13/1879, 3/19/1885, 7/7/1897 and 1/18/1914 claiming likewise. The last one, titled "NEW YORK VETERANS DINE. ; One Hundred at Annual Feast of Old-Timers of Athletic Club" includes this sentence: "An illuminated model of the Knickerbocker Cottage, now Mouquin's, at Sixth Avenue and Twenty-Eighth Street, where the club was organized in 1868, was displayed over the fireplace." It's hard to believe that a glaring factual error in reporting would have been repeated so frequently over that period of time. Submitted by kennynyny on Mon, 02/16/2009 - 12:52pm. The restaurant was at 28th Street and Sixth Avenue; the Sixth Avenue addresses were renumbered in 1929 when the street was extended south for the construction of the IND subway. 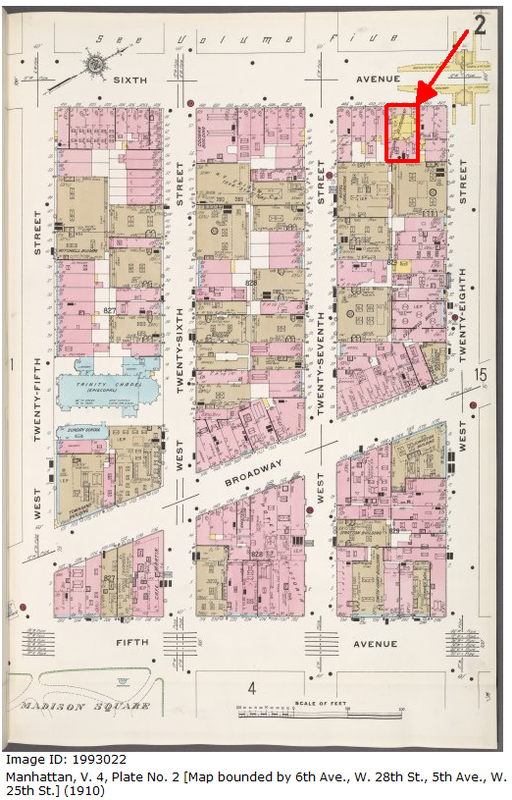 There's a 1910 insurance company map at the NYPL Digital Gallery showing Mouquin's Restaurant at 456 6th Avenue between 27th and 28th Streets. Currently the Archstone Chelsea at 800 6th Avenue occupies the entire side of the block. Last edited by kevinpacheco; January 30th, 2012 at 12:12 AM. Kevinp That is probably the single most fantastic post I have ever read: thanks a million. I did a lot of digging (aparantly not enough) an did not come up with anything like that, so 'crowd sourcing' on this question has really help out a lot. Thanks again, 'and may peace be with you'. So what I am looking for is the building that was located on Sixth Avenue at 10/11th street. The facade of building (particularly the masonry details on the window lintel/sill) looks exactly the same. See the google street view I have posted further down on this thread - that facade is an exact match. According to this source it was on 10/11th street & 6th avenue; regardless of what the street address number. The current facade of the building on 10/11th street looks exactly like the vintage photo of the Knickerbocker Cottage that was originally located at 456 Sixth Avenue, New York (between 10th and 11th Streets. 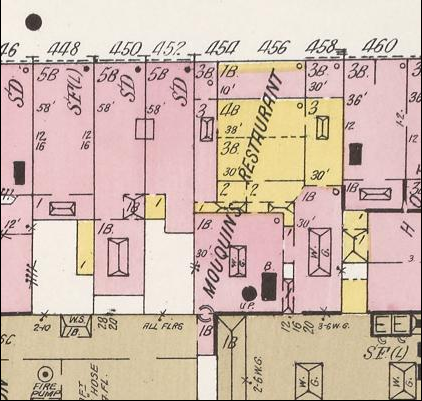 Well, now - according to this archive - it seems Knickerbocker Cottage was located up around 27th street and 6 Avenue. There is some discrepancy in the records regard the location of the building depicted with the sign of the facade reading 'Knickerbocker Cottage'. Last edited by infoshare; January 30th, 2012 at 06:50 PM. The 'Archstone' chelsea building now occupies the site of the building I referred to here a 'knickerbocker cottage or Mouiquins Restaurant' all of which has been remove, along with several other adjoining buildings for the construction of the Archstone Building. There is a photo at this site which can be enlarged. Thanks again for the help in finding this information on the original 'knickerbocker Cottage'. The 'Shriners' and the Knickerbocker Cottage in New York City. The "knights creed" and Knickerbocker Cottage. See quotes from window covering installers and industry members spreading the word about 'child & pet safety' - spreading the word, worldwide. What happened is that in 1920, 6th Ave was extended south of Carmine Street, where it used to start, so they had to renumber everything. So before 1920, 456 6th Avenue would have been between 27th and 28th. Today, it's at 10th/11th Streets. Thank you Dolores. I had completely given up on this thread, and this esoteric research project, as I had hit a impass on this discrepancy regarding the location: your post has provided the missing piece in the puzzle.